There are a variety of ways to start H2O, depending on which client you would like to use. The instructions below assume that you already downloaded and installed H2O. If you have not, then please refer to the Downloading & Installing H2O section. Use the h2o.init() method to initialize H2O. This method accepts the following options. Note that in most cases, simply using h2o.init() is all that a user is required to do. nthreads: This launches H2O using all available CPUs and is only applicable if you launch H2O locally using R. If you start H2O locally outside of R or start H2O on Hadoop, the nthreads parameter is not applicable. ip: The IP address of the server where H2O is running. port: The port number of the H2O server. startH2O: (Optional) A logical value indicating whether to try to start H2O from R if no connection with H2O is detected. This is only possible if ip = "localhost" or ip = "127.0.0.1". If an existing connection is detected, R does not start H2O. forceDL: (Optional) A logical value indicating whether to force download of the H2O executable. This defaults to FALSE, so the executable will only be downloaded if it does not already exist in the H2O R library resources directory at h2o/java/h2o.jar. enable_assertions: (Optional) A logical value indicating whether H2O should be launched with assertions enabled. This is used mainly for error checking and debugging purposes. license: (Optional) A character string value specifying the full path of the license file. max_mem_size: (Optional) A character string specifying the maximum size, in bytes, of the memory allocation pool to H2O. This value must a multiple of 1024 greater than 2MB. Append the letter m or M to indicate megabytes, or g or G to indicate gigabytes. min_mem_size: (Optional) A character string specifying the minimum size, in bytes, of the memory allocation pool to H2O. This value must a multiple of 1024 greater than 2MB. Append the letter m or M to indicate megabytes, or g or G to indicate gigabytes. ice_root: (Optional) A directory to handle object spillage. The default varies by OS. strict_version_check: (Optional) Setting this to FALSE is unsupported and should only be done when advised by technical support. ignore_config: (Optional) This option allows you to specify whether to perform processing of a .h2oconfig file. When h2o.init() is specified, a call to a config reader method is invoked. This call can result in path issues when there is no “root” (for example, with a Windows network drive) because the config file reader searches up to “root.” When there is no “root”, the path to search will continue to expand, eventually result in an error. This value defaults to False. proxy: (Optional) A character string specifying the proxy path. https: (Optional) Set this to TRUE to use https instead of http. insecure: (Optional) Set this to TRUE to disable SSL certificate checking. username: (Optional) The username to log in with. password: (Optional) The password to log in with. cookies: (Optional) Vector (or list) of cookies to add to request. By default, h2o.init() first checks if an H2O instance is connectible. If it cannot connect and start = TRUE with ip = "localhost", it will attempt to start an instance of H2O at localhost:54321. If an open ip and port of your choice are passed in, then this method will attempt to start an H2O instance at that specified ip and port. When initializing H2O locally, this method searches for the h2o.jar file in the R library resources (system.file(“java”, “h2o.jar”, package = “h2o”)), and if the file does not exist, it will automatically attempt to download the correct version from Amazon S3. The user must have Internet access for this process to be successful. Once connected, the h2o.init() method checks to see if the local H2O R package version matches the version of H2O running on the server. If there is a mismatch and the user indicates he/she wants to upgrade, it will remove the local H2O R package and download/install the H2O R package from the server. Note: You may want to manually upgrade your package rather than waiting until being prompted. This requires that you fully uninstall and reinstall the H2O package and the H2O client package. You must unload packages running in the environment before upgrading. We also recommended that you restart R or R studio after upgrading. Starting H2O JVM and connecting: .. Connection successful! Use the h2o.init() function to initialize H2O. This function accepts the following options. Note that in most cases, simply using h2o.init() is all that a user is required to do. ip: The ip address (or host name) of the server where H2O is running. port: Port number that H2O service is listening to. https: Set to True to connect via https:// instead of http://. insecure: When using https, setting this to True will disable SSL certificates verification. username: The username to log in with when using basic authentication. password: The password to log in with when using basic authentication. cookies: Cookie (or list of) to add to each request. proxy: The proxy server address. start_h2o: If False, do not attempt to start an H2O server when a connection to an existing one failed. nthreads: “Number of threads” option when launching a new H2O server. ice_root: The directory for temporary files for the new H2O server. enable_assertions: Enable assertions in Java for the new H2O server. max_mem_size: Maximum memory to use for the new H2O server. min_mem_size: Minimum memory to use for the new H2O server. strict_version_check: If True, an error will be raised if the client and server versions don’t match. Checking whether there is an H2O instance running at http://localhost:54323..... not found. Connecting to H2O server at http://127.0.0.1:54323... successful. This section describes how run H2O in an Anaconda Cloud environment. 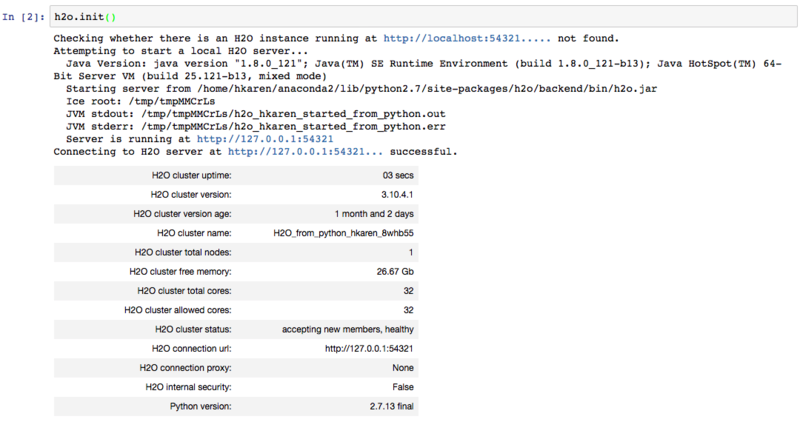 This section assumes that you have installed H2O on Anaconda using the instructions in the Install on Anaconda Cloud section. Open a Terminal window and launch jupyter notebook. Create a new Python notebook by selecting the New button in the upper left corner. At this point, you can begin using Jupyter Notebook to run H2O Python commands. An example notebook follows. After you successfully launch Jupyter notebook, enter the following commands to run a GBM example. Import the H2O and GBM modules. Import the Airlines dataset. This dataset will be used to classify whether a flight will be delayed. Set the predictor names and the response column name. Split the dataset into training and validation sets. Specify the number of bins that will be included in the historgram and then split. Print the AUC scores for the training data and the validation data. If your system includes two versions of Anaconda (a global installation and a user-specific installation), be sure to use the User Anaconda. Using the Global Anaconda will result in an error when you attempt to run commands in Jupyter Notebook. You can verify the version that you are using by running which pip (Mac) or where pip (Windows). If your system shows that your environment is set up to use Global Anaconda by default, then change the PATH environment variable to use the User Anaconda. You can use Terminal (OS X) or the Command Prompt (Windows) to launch H2O. When you launch from the command line, you can include additional instructions to H2O 3.0, such as how many nodes to launch, how much memory to allocate for each node, assign names to the nodes in the cloud, and more. Note: H2O requires some space in the /tmp directory to launch. If you cannot launch H2O, try freeing up some space in the /tmp directory, then try launching H2O again. For more detailed instructions on how to build and launch H2O, including how to clone the repository, how to pull from the repository, and how to install required dependencies, refer to the developer documentation. The arguments use the following format: java <JVM Options> -jar h2o.jar <H2O Options>. -version: Display Java version info. -Xmx<Heap Size>: To set the total heap size for an H2O node, configure the memory allocation option -Xmx. By default, this option is set to 1 Gb (-Xmx1g). When launching nodes, we recommend allocating a total of four times the memory of your data. Note: Do not try to launch H2O with more memory than you have available. -h or -help: Display this information in the command line output. -version: Specify to print version information and exit. -name <H2OCloudName>: Assign a name to the H2O instance in the cloud (where <H2OCloudName> is the name of the cloud). Nodes with the same cloud name will form an H2O cloud (also known as an H2O cluster). -flatfile <FileName>: Specify a flatfile of IP address for faster cloud formation (where <FileName> is the name of the flatfile). IPv6: -ip 2001:db8:1234:0:0:0:0:1 (Short version of IPv6 with :: is not supported.) Note: If you are selecting a link-local address fe80::/96, it is necessary to specify the zone index (e.g., %en0 for fe80::2acf:e9ff:fe15:e0f3%en0) in order to select the right interface. -port <#>: Specify a PORT used for REST API. The communication port will be the port with value +1 higher. -baseport: Specifies the starting port to find a free port for REST API, the internal communication port will be port with value +1 higher. -network <ip_address/subnet_mask>: Specify an IP addresses with a subnet mask. The IP address discovery code binds to the first interface that matches one of the networks in the comma-separated list; to specify an IP address, use -network. To specify a range, use a comma to separate the IP addresses: -network 123.45.67.0/22,123.45.68.0/24. For example, 10.1.2.0/24 supports 256 possibilities. IPv4 and IPv6 addresses are supported. -ice_root <fileSystemPath>: Specify a directory for H2O to spill temporary data to disk (where <fileSystemPath> is the file path). -log_dir <fileSystemPath>\: Specify the directory where H2O writes logs to disk. (This usually has a good default that you need not change. -log_level <TRACE,DEBUG,INFO,WARN,ERRR,FATAL>: Specify to write messages at this logging level, or above. The default is INFO. -flow_dir <server-side or HDFS directory>: Specify a directory for saved flows. The default is /Users/h2o-<H2OUserName>/h2oflows (where <H2OUserName> is your user name). -nthreads <#ofThreads>: Specify the maximum number of threads in the low-priority batch work queue (where <#ofThreads> is the number of threads). -client: Launch H2O node in client mode. This is used mostly for running Sparkling Water. -context_path <context_path>: The context path for jetty. -jks <filename>: Specify a Java keystore file. -jks_pass <password>: Specify the Java keystore password. -hash_login: Specify to use Jetty HashLoginService. This defaults to False. -ldap_login: Specify to use Jetty LdapLoginService. This defaults to False. -kerberos_login: Specify to use Kerberos LoginService. This defaults to False. -pam_login: Specify to use the Pluggable Authentication Module (PAM) LoginService. This defaults to False. -login_conf <filename>: Specify the LoginService configuration file. -form_auth: Enables Form-based authentication for Flow. This defaults to Basic authentication. -session_timeout <minutes>: Specifies the number of minutes that a session can remain idle before the server invalidates the session and requests a new login. Requires -form_auth. This defaults to no timeout. -internal_security_conf <filename>: Specify the path (absolute or relative) to a file containing all internal security related configurations. Retrieve a list of available interfaces (which are up). Sort them with “bond” interfaces put on the top. For each interface, extract associated IPs. If there is a site IP, use it. New H2O nodes join to form a cloud during launch. After a job has started on the cloud, it prevents new members from joining. Wait for the INFO: Registered: # schemas in: #mS output before entering the above command again to add another node (the number for # will vary). In this mode, H2O is using IP multicast to announce existence of H2O nodes. Each node selects the same multicast group and port based on specified shared cloud name (see -name option). For example, for IPv4/PORT a generated multicast group is 228.246.114.236:58614 (for cloud name michal), for IPv6/PORT a generated multicast group is ff05:0:3ff6:72ec:0:0:3ff6:72ec:58614 (for cloud name michal and link-local address which enforce link-local scope). For IPv6 the scope of multicast address is enforced by a selected node IP. For example, if IP the selection process selects link-local address, then the scope of multicast will be link-local. This can be modified by specifying JVM variable sys.ai.h2o.network.ipv6.scope which enforces addressing scope use in multicast group address (for example, -Dsys.ai.h2o.network.ipv6.scope=0x0005000000000000 enforces the site local scope. For more details please consult the class water.util.NetworkUtils). For more information about scopes, see the following image. The resulting cluster will be formed by nodes A, B, C. The node A transitively sees node C via node B flatfile definition, and vice versa. The flatfile contains a list of nodes in the form IP:PORT that are going to compose a resulting cluster (each node on a separated line, everything prefixed by # is ignored). Running H2O on a multi-node cluster allows you to use more memory for large-scale tasks (for example, creating models from huge datasets) than would be possible on a single node. The web server IP is auto-configured in the same way as internal communication IP, nevertheless the created socket listens on all available interfaces. A specific API can be specified with the -web_ip option. Refer to the Getting Started with Sparkling Water section for information on how to launch H2O on Spark. © Copyright 2016-2018 H2O.ai. Last updated on Aug 09, 2018.